Today I am making pizza for dinner. I typically make it all from scratch, starting the dough in the morning in the morning and making pizza sauce in the afternoon. It is really not that hard to make pizza from scratch although it does need some organisation. But I think the end result is much more tasty, much more nutritious and much more frugal (both because it costs much less to make from raw ingredients but also because you are eating something much more filling!). 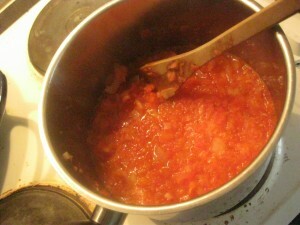 I warn you that my way of making a pizza sauce would probably make an Italian nonna faint! Simply, fry off the onion until soft in a saucepan, add the tomatoes and water and let simmer slowly until nicely reduced. You can then blitz the mixture again with a stick blender to make a smooth sauce or leave it as is. Then add herbs/salt to your taste! Freeze any left overs for future pizza!